From the bestselling author of The Ballroom Café and The Judge's Wife comes a new story of friendship, resilience and compassion, and how women support each other through the most difficult times. Connie Carter has lost everyone and everything dear to her. Leaving her home in New York, she moves to a run-down Irish mansion, hoping to heal her shattered heart and in search of answers: how could her husband do the terrible things he did? And why did he plough all their money into the dilapidated Ludlow Hall before he died, without ever telling her? At first Connie tries to avoid the villagers, until she meets local women Eve and Hetty who introduce her to the Ludlow Ladies’ Society, a crafts group in need of a permanent home. Connie soon discovers Eve is also struggling with pain and the loss of having her beloved Ludlow Hall repossessed by the bank and sold off. Now, seeing the American Connie living there, the hurt of losing everything is renewed. Can these women ever be friends? Can they ever understand or forgive? As the Ludlow Ladies create memory quilts to remember those they have loved and lost, the secrets of the past finally begin to surface. But can Connie, Eve and Hetty stitch their lives back together? 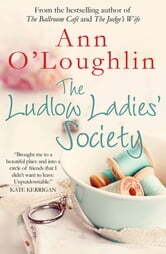 **"The Ludlow Ladies' Society brought me to a beautiful place and into a circle of friends that I didn’t want to leave. Unputdownable." "A moving tale of loss, love and redemption"
"A richly woven tale of passion, conspiracy, hypocrisy and a chilling secret." "An uplifting read, the kind of book you want to gobble up in one sitting." 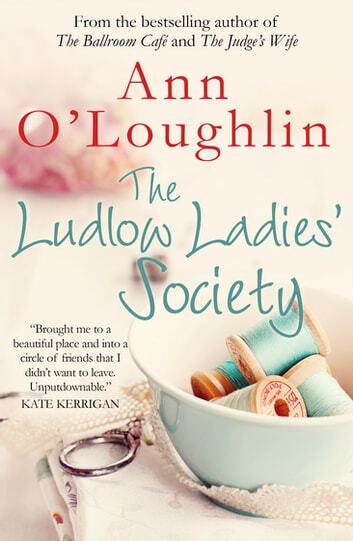 A beautiful story of friendshIp and how women support each other, Ann O'Loughlin has done it again. I was in tears and then I was laughing. The women stitch memory quilts and as they do secrets emerge. There is a great twist at the end but it is the writing that captivated me. If you liked The Ballroom Cafe then you will love this book. This book is beautifuly crafted. A stoey of courage and hope, the great strength of women and their support og one another. To call it a bitter sweet tale is an understatement it cept me up reading all night, it made me cry, itwas also hope full. I just loved the whole book. A very interesting story with a great twist at the end. Thought provoking,sometimes bringing a tear to my eye at others a wry smile, this book deals with loss in a sensitve manner, and the main characters, while dealing with all that life can throw at them, show the true meaning of friendship and how with help from others life can be worth living to the full.